Posted on Oct 22, 2016, in Kankool, Signalling, Trackwork and tagged kankool, lever frame, turnouts, wire-in-tube. Bookmark the permalink. 4 Comments. Are 6 & 8 just the safety locks on levers ? Because, Gundagai has a cross over just like that. With the lever doing a threaded run through both sets of points. So, question, is there two levers at Kankool ? Gundagai has a lever to throw at both points, with safety locks, but also inter-connected, so you would have to have two people to throw the levers together. If it needs two safety keys, the guy is obviously right there, but it seems to be a thing too far that is probably normal procedure. Hi Dave. Yes, 6 & 8 are the respective facing point locks (FPL) levers for both 7 turnouts. There is only one lever 7 in the frame to operate both turnouts. 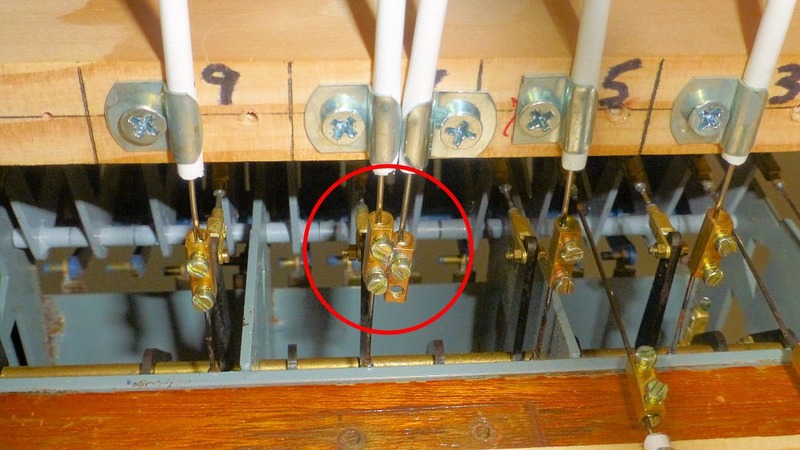 In this instance, all turnouts and signals are controlled from the lever frame in the signal box, so there are no local ground frames, if that’s what you are referring to. Also, it is not a crossover at Kankool. The 7 turnout on the loop is really a catchpoint for the main, which has a short run-off track. Cheers, Ian. Interesting… how come the dual numbers eg 7 6 or 7 8 or? Hi Nick. The 6 and 8 designations are the respective facing point locks (FPL) for each turnout 7.